- I open slowly the doors and windows, but the alarm does not respond..
Infisensis is designed in such a way as to protect areas which are thoroughly secured by their owner. Windows must be closed and latched and the doors locked . Under these conditions, any aspiring burglar trying to enter your space creates (small) vibrations which are immediately detected by the system. On Youtube you can see many videos showing security checks on doors and windows and get insight into the vibrations giving rise to such action. - What is the difference between the sensitivity of the hardness? InfiSENSIS can cover a range of up to 200 square meters. In a simplistic way you can visualize this area you can imagine as a round ball with the alarm in the center . The "sensitivity" variably reduces the radius of action alert. If for example you want to cover a smaller area you may set the sensitivity to small values ​​. By doing this you will secure your space adequately, while if you want to cover a larger area (within the system limits), set the sensitivity at higher values to increase the operational coverage of the system and secure the whole area with a single device . The parameter "hardness" is something completely different. It is related to the response of the system to different kind of vibration (and not to the coverage area). Ideally, this parameter should be in the "low" so that the alarm can perceive even the lightest touch on windows and doors. If your space is exposed to low frequency vibration sources such as strong wind, then this parameter should be put in the "high" for avoiding false alarms; however reducing somewhat the effectiveness of the system. - I set the alarm in my house and, while away, it gives frequent alarms. What to do? Make sure you understand the difference between the parameters of "sensitivity" and "hardness" and that you have selected the appropriate values ​​depending on your space. Try moving the alarm from its original position and place it in another location (away from doors or large openings) where the "sphere of influence" will not include unwanted vibration sources such as those from adjacent apartments, or any other noise sources. If you are away you can adjust your system parameters through SMS or inquire about the system status through your mobile phone. In any case, if an event occurs in the protected area, the system will alert you wherever you are. - I have configured infiSENSIS and most of the time it works flawlessly. However, sometimes I get alarms for no obvious reason.. When you are inside the house with infiSENSIS enabled, the system will operate normally. Nevertheless, some rare events can confuse the system . For example, a sudden door or cabinet opening or closing, children playing upstairs can create infrasound and activate the system. Normally, these events go unnoticed by the owners who think that the system is activated unnecessarily. The fact is, that when the house is empty, events of this kind mean violation and are perceived this way by infiSENSIS. Our advice is to create separate profiles in the system when you are within your space and when you are away. Thus, the system will be more ‘strict’ in your absence and recognize such events as possible violation attempts, while it will be more flexible during your stay at home. -In my house I have a pet. Can I use infiSENSIS or will I have a problem? You can safely use the infiSENSIS, since pets do not bother the system in the same way that the system does not bother them! - Most systems use magnetic contacts on doors, radars and other sensors. Is infiSENSIS better? Legacy systems use various sensors on doors and windows which alert you about an intrusion after it happens. This means that the intruder is already inside your house. InfiSENSIS perceives violation attempts well before they are completed thus giving you time to react. InfiSENSIS works without cable sensors and it is not susceptible to potential vulnerabilities that these systems could exhibit . It can also operate in a covert fashion (even placed inside a closet or a drawer). InfiSENSIS is not affected by the presence of pets inside the house and it is readily portable should you decide to take it with you when you move . 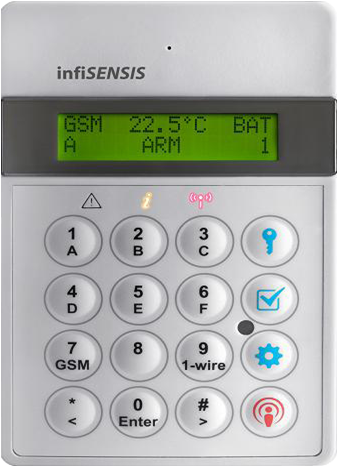 It is therefore obvious that InfiSENSIS is a superior next generation alarm system. Moreover, it is more affordable than other systems, since it requires no installation, does not need all those costly external sensors and does not require maintenance. - I have some special requirements for the alarm system I will use. I definitely want to have some special sensors. Can I still use my infiSENSIS? InfiSENSIS has inputs for a plethora of commercial sensors. This means that it can easily work with most types of sensors on the market. It has also a relay output to support external siren, lights on/off and other remote control capabilities to match your needs. - I've heard that infiSENSIS can be upgraded in the future to incorporate new advanced features. Any information regarding new advanced features will be readily available through our website: www.infisensis.com. For software upgrades please consult your local dealer.